The UK’s Advertising Standards Authority has pulled an advert for a London clinic as it gives the impression it’s an abortion clinic. The advertisement that was deemed misleading by the UKs Advertising Standards Authority. THE ADVERTISING STANDARDS Authority (ASA) in the UK has pulled an advert for the Central London Women’s Centre (CLWC) because it gives the impression that it “offered terminations and was therefore an abortion clinic”. The British Pregnancy Advisory Service challenged whether the claims on the website were misleading, because it was unclear that the service did not refer women directly for a termination. Considering Abortion? For an Immediate Appointment: Fill in our online booking form or call us on [telephone number]. Abortion Alternatives Free Confidential Advisory Service Free Pregnancy Testing Special Service for Teens – Confidential and Supportive. Irish visitors to our site get a quick, local appointment and get all the information you need. The challenge was upheld, with the ASA stating that the advert gave the impression that the advertiser offered terminations and was therefore an abortion clinic. The ASA stated that the advertising was “irresponsible, because women seeking a termination could be unnecessarily delayed by contacting the advertiser under the false impression that CLWC was an abortion clinic and would offer impartial advice. We therefore concluded that the advertising was both misleading and irresponsible. Speaking to TheJournal.ie, Sinead Ahern from Choice Ireland said that this sort of misleading advertising is common place in Ireland. “We have been campaigning on this for a number of years. There is a lack of regulation here and a lack of clear labelling of crisis pregnancy agencies. Many say that they can provide direct referrals or have links with clinics abroad when they do not,” she said. There is no regulation as to what these centres can advertise themselves as,” she said, adding, “while in the UK, rulings like this by the ASA are to be welcomed, the Irish ASAI (Advertising Standards Authority of Ireland) say there is nothing they can do. She said Pro Choice Ireland had called on the ASAI to widen their remit and regulate. “They said as these centres are not commercial enterprises, there is nothing they can do. They can carry on giving misleading advice and advertise misleading information about the service they provide and it is all perfectly legal,” she said. “Anyone signposting that they are a service health provider or crisis pregnancy counsellor should be under the remit of the ASA, whether they are a commercial enterprise or not,” said Ahern. She said Pro Choice Ireland were calling on the government to go one step further and establish a licensing system for crisis pregnancy agencies. “It is a very important and serious decision for any woman to make and these women are very vulnerable when they are making this decision. Right now there is no legislation around that ensures someone is properly qualified to counsel someone and there is no ethical or legal guidelines on how one can offer a service and how one can advertise a service,” she said. 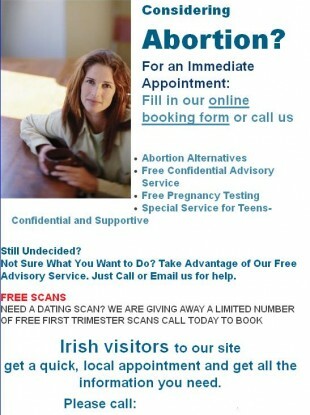 Email “London women's centre advert that appeals to 'Irish visitors' is misleading”. Feedback on “London women's centre advert that appeals to 'Irish visitors' is misleading”.